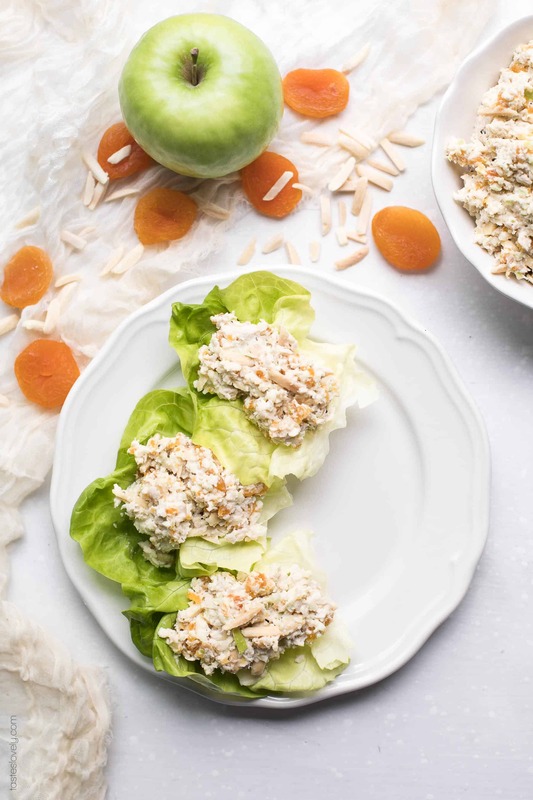 Paleo + Whole30 Apricot and Almond Chicken Salad Recipe – a light and flavorful chicken salad with green apple, dried apricots and crunchy almonds. My favorite meal prep lunch for the week! Gluten free, grain free, dairy free, sugar free, soy free, clean eating. 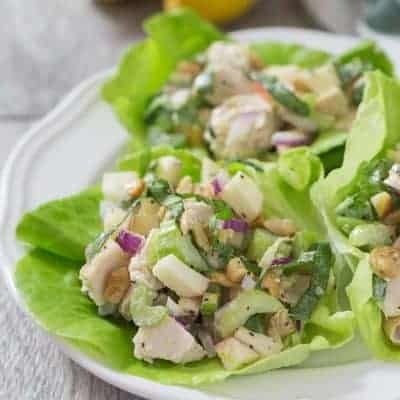 Another delicious chicken salad recipe to share with you! 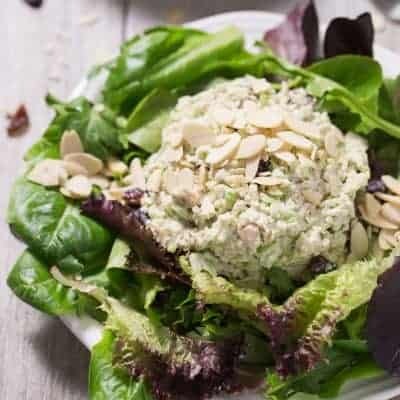 This paleo + whole30 apricot and almond chicken salad has been my lunch on and off all summer and I’m still not sick of it. It is delicious! I’ve already shared how much I love a good chicken salad. It is honestly my lunch almost every single day. I love that I can make a big batch on Sundays, and have a healthy and protein packed lunch ready in just 2 minutes during the week. When you have a 2.5 year old and a newborn, a fast and healthy lunch is exactly what you need in your life. 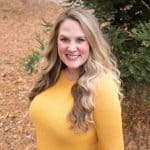 I’ve shared my paleo + whole30 lemon basil chicken salad, my paleo + whole30 green apple and cranberry chicken salad, and my paleo + whole30 curried chicken salad. 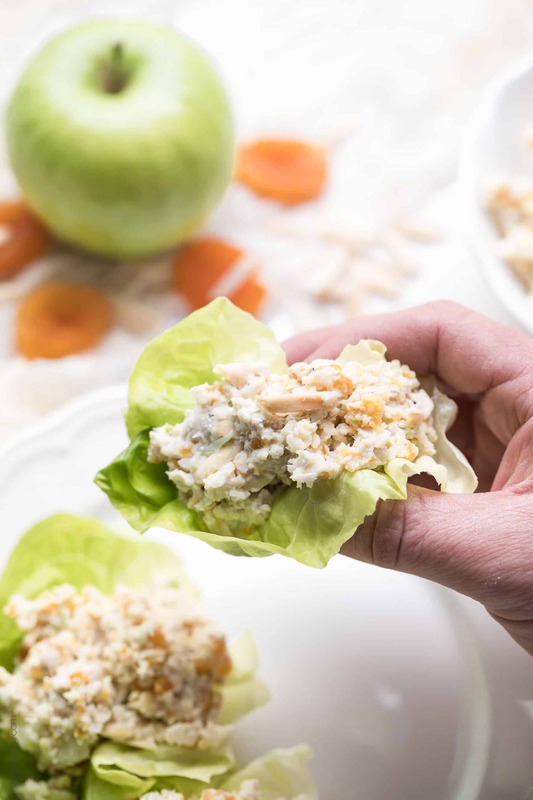 And now I’ve started adding in this paleo + whole30 almond and apricot chicken salad variation. 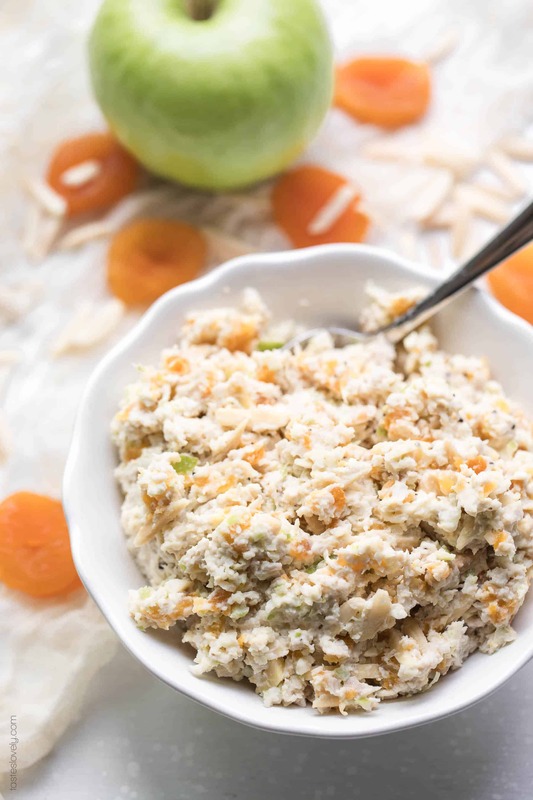 By using my food processor, this paleo + whole30 apricot and almond chicken salad comes together so quickly. The food processor chops all the vegetables, apples and dried fruit for me. I add all the chopped ingredients into a bowl, add in some of my homemade paleo + whole30 mayonnaise (have you made this yet? It is SO GOOD and easy! ), stir, and my lunch is ready for the week! 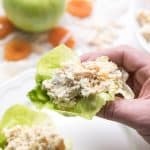 I rotate between serving this paleo + whole30 apricot and almond chicken salad in butter lettuce cups, or a scoop on top of baby green lettuce. Both ways are delicious, healthy and so easy to throw together. It just depends on what I’m in the mood for that day. And I enjoy it guilt free because I am getting tons of protein, and my lunch is paleo, whole30, gluten free, grain free, dairy free, sugar free, soy free, clean eating, real food. Preheat oven to 425ºF, and line a rimmed baking sheet with parchment paper (for easy cleanup). Drizzle the chicken breasts with olive oil, and season with 1 teaspoon of salt and pepper. Roast until the chicken reaches an internal temperature of 165ºF, about 15-20 minutes depending on the thickness of your chicken. Remove from oven, and allow to rest until cool enough to touch. Then chop into 1″ chunks. In your food processor with the S-Blade attachment, pulse the celery until finely chopped. Transfer to a the large mixing bowl size bowl. Pulse the apples until finely chopped. Transfer to the same bowl as the celery. Pulse the chicken until finely chopped. Transfer to the same bowl as the apple and celery. Pulse the dried apricot until finely chopped. Transfer to the same bowl as the celery, apple and chicken. Add the mayo, almonds, 1 teaspoon salt and pepper to the chopped apple, celery, chicken and dried apricots. Stir to combine. Taste and add more salt, pepper and/or mayo if desired. Transfer to an airtight container and refrigerate. Best eaten at least 1 hour after refrigerating so the flavors can marinate. Will keep refrigerated for 1 week. Scoop served on top of spring greens. No dressing needed, or toss the greens with desired dressing. 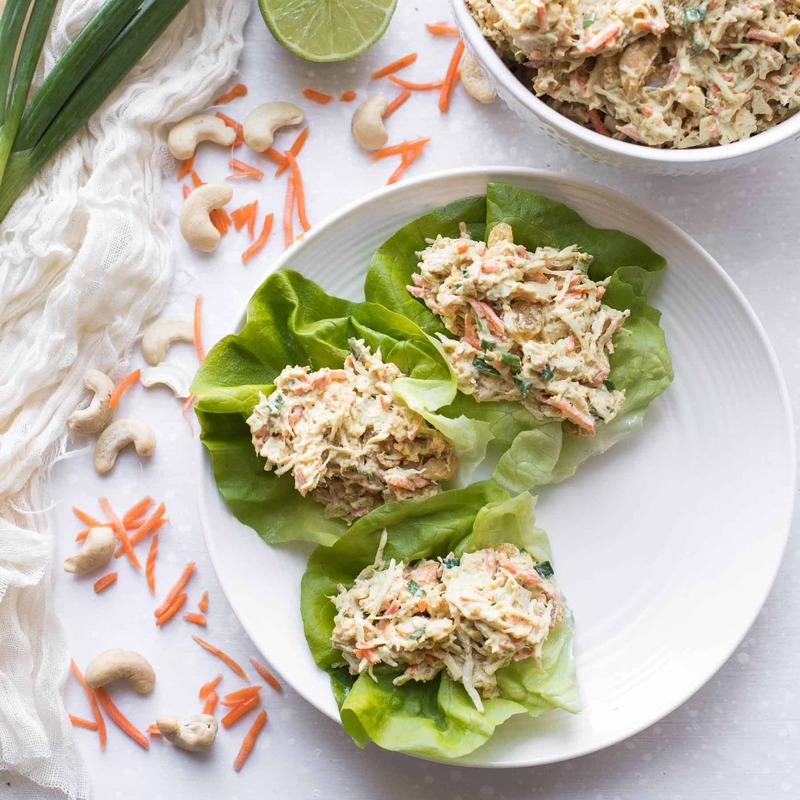 Scoop into butter lettuce cups and eat like lettuce wraps. Eat it scooped on to cucumber slices, celery slices, carrot sticks, etc.